Making a St Bridget’s Cross is a custom in Ireland. The St Bridget’s Cross is made out of plants called rushes (Juncus effusus) for hanging above the entrances to dwellings to invoke the help of St Bridget in warding off disease. St Bridget’s Day is celebrated on the 1st February each year and the crosses are made at that time. 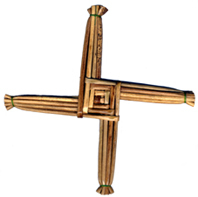 Rushes were traditionally used to make the St Bridget’s Cross. These were collected from wetlands and cut into pieces, 8-12 inches long. Rushes can be hard to get for city dwellers so ordinary paper environmentally friendly drinking straws are a good substitute. Use rubber bands to tie up the ends. You can watch an IPCC video showing you how to make a cross. Please follow this link. Hold one of the straws vertically. 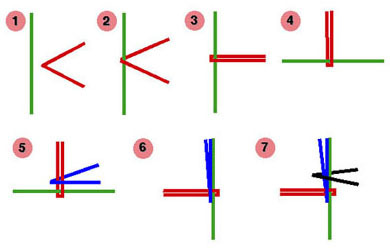 Fold a second straw in half as in the diagram. Place the first vertical staw in the centre of the folded second straw. Turn the two straws held together 90 degrees counter clockwise so that the open ends of the second straw are projecting vertically upwards. Fold a third straw in half and over both parts of the second straw to lie horizontally from left to right against the first straw. Hold tight. Holding the centre tightly, turn the three staws 90 degrees counter clockwise so that the open ends of the third staw are pointing upwards. Fold a new straw in half over and across all the staws pointing upwards. Repeat the process of rotating all the straws 90 degrees counter clockwise, adding a new folded straw each time until all nine straws have been used up to make the cross.